Here's how to trade Advanced Micro Devices, one of the best performers in the tech sector this year. It's been a blockbuster year for shares of Advanced Micro Devices (AMD - Get Report) . Since the start of 2018, shares of this microprocessor stock have charged more than 194% higher, making it one of the best performers in the tech sector this year. And that means that AMD investors are naturally feeling a little anxious here, as shares hover near multi-year highs. The good news is that the data suggest AMD could have a lot further to run. But there are some key levels to watch. Stocks tend to trend, after all. More specifically, research by Yale Professor William Goetzmann published by the National Bureau of Economic Research in 2016 showed that 42 different stock markets studied from 1900 to 2014 supported that idea that markets that go up often keep on going up. In fact, a stock market that's doubled in the past year is almost twice as likely to double again as it is to get cut in half in the year that follows. While that flies in the face of the conventional investing wisdom, it provides some empirical backup for investing in frothy markets like the one we're in today. And for investing in frothy stocks like AMD. 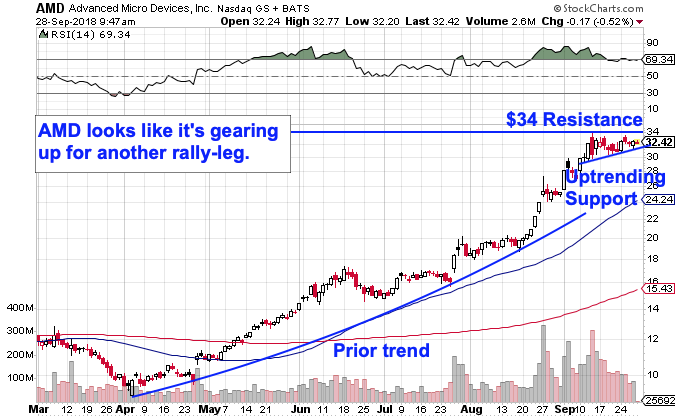 You don't need to be an expert technical trader to figure out that the general trend for AMD has been pointing up and to the right for most of the last year. More recently, though, shares have cooled off in September, consolidating sideways in a range just below the $34 level. That's actually not a red flag; it's a pretty textbook example of a technical continuation pattern that could be setting the stage for another up-leg in the final stretch of 2018. AMD is currently forming a short-term version of an ascending triangle pattern, a continuation setup formed by horizontal support up above shares at $34 and uptrending support to the downside. Simply put, as AMD bounces in between those two technically meaningful price levels, shares have been getting squeezed closer and closer to breakout territory. When shares muster the strength to catch a bid above $34, we've got a pretty clear signal that buyers are back in control of things. Risk management is crucial in any momentum name like AMD. Since the 50-day moving average has been acting like a rough proxy for this stock's uptrend since the summer months, it's a logical place to park a protective stop beneath. If AMD violates its 50-day, you don't want to own it any more. Meanwhile, shares look primed for more upside in the near-term.